The Baltic Sea Philharmonic and Kristjan Järvi kick off the second half of their groundbreaking ‘Waterworks’ tour tomorrow with a performance at Berlin’s Konzerthaus as part of the Young Euro Classic festival. The orchestra debuted ‘Waterworks’ back in May, wowing audiences in Hattingen, Germany, and Aarhus and Copenhagen in Denmark with a pioneering fusion of music, lighting, sound design and projection art. Now ‘Waterworks’ returns to Germany for a series of four performances: after Berlin the orchestra will perform at the Usedom Music Festival in Peenemünde on 26 August, then in Lutherstadt Wittenberg on 27 August, and finally in Hamburg at the Elbphilharmonie on 29 August. The concerts in Berlin and Hamburg will both be livestreamed. The performance in Berlin is one of seven concerts from this year’s Young Euro Classic festival being livestreamed by European culture channel Arte. Our concert at Hamburg’s Elbphilharmonie will be livestreamed on the Elbphilharmonie website, and will also be broadcast live on a giant screen to spectators in the Plaza outside the venue. The Elbphilharmonie performance will be shown again three times during the Hamburg Cruise Days event from 8 to 10 September. The ‘Waterworks’ programme includes one of the most famous of all water-themed pieces – Handel’s Water Music, in a special arrangement featuring variations by contemporary composers Charles Coleman and Gene Pritsker. The orchestra also celebrates the 80th birthday of American composer Philip Glass by performing his Aguas da Amazonia – in a new orchestration by Charles Coleman – and his Violin Concerto No. 2 ‘The American Four Seasons’, with Russian-born violinist Mikhail Simonyan as soloist. ‘Waterworks’ heralds an exciting new era for the Baltic Sea Philharmonic, with the introduction of an immersive concert show format in cooperation with Sunbeam Productions that fuses music, lighting, projection art and sound design to stunning effect. The musicians also have a striking new look on stage, thanks to a clothing collaboration with Monton, a leading brand of Estonian fashion house Baltika Group. The second half of the ‘Waterworks’ tour begins just a few days after the completion of the orchestra’s ‘Baltic Folk’ tour of Sweden, Germany and Italy. On this tour, its second of 2017, the Baltic Sea Philharmonic performed a folk-inspired programme of music by Stravinsky, Rachmaninoff and Arvo Pärt to 2,000 people, and made a daring shift from orchestral convention by playing Stravinsky’s The Firebird entirely from memory. Download the ‘Waterworks ’ tour programme and book tickets for the remaining tour concerts here. The Baltic Sea Philharmonic’s concert at the 30th Rheingau Music Festival in Germany is to be livestreamed by Medici TV, the world’s leading classical music channel, and on the festival’s website (www.rheingau-musik-festival.de). The broadcast of the concert, at 7.00 pm CET on Sunday 20 August in Wiesbaden’s Kursaal, will be the first ever live stream in the festival’s history. The performance marks a return visit for Kristjan Järvi and the Baltic Sea Philharmonic, who first played at the festival in 2014. The concert in Wiesbaden will be the second of three concerts on the orchestra’s ‘Baltic Folk’ tour of Sweden, Germany and Italy this August. Kristjan will conduct the orchestra in a folk-inspired programme of music from Estonia and Russia. The concert opens with the contemplative, hymn-like Swansong by Arvo Pärt, the celebrated Estonian composer whose music is both deeply spiritual and emotionally direct. Then we present two of the best-loved orchestral works of the early 20th century: Rachmaninoff’s achingly nostalgic Piano Concerto No. 2 and Stravinsky’s groundbreaking, folktale-inspired ballet The Firebird. The Baltic Sea Philharmonic and Kristjan Järvi have arrived in Visby, on the picturesque Swedish island of Gotland, for the first stop on their new ‘Baltic Folk’ tour. Following six days of intensive rehearsals, the orchestra will take to the stage of the Wisby Strand Concert Hall on Saturday 19 August to perform a folk-inspired programme of music by Stravinsky, Rachmaninoff and Arvo Pärt. The musicians will then travel to Wiesbaden in Germany for a concert the next day as part of the Rheingau Music Festival. The tour concludes on 23 August in Merano, northern Italy, where the orchestra has the honour of opening the Merano Music Festival. Both festival appearances will be return visits for the Baltic Sea Philharmonic. The orchestra last played at the Merano Music Festival in 2011, and the Rheingau Music Festival is welcoming us back in its 30th anniversary year, after our previous appearance in 2014. The orchestra’s concert in Wiesbaden this month will be the first ever livestreamed event in the history of this prestigious festival to be broadcasted on the festival’s website. Visby is a special place for the orchestra, and is in many ways the perfect location for the start of our new tour. The Baltic Sea Philharmonic has always been concerned for the environment, and on Gotland, with its picturesque beaches, lakes and rocky outcrops, it’s impossible not to feel deeply connected to nature. One of the best-preserved medieval cities in northern Europe, Visby is also where the idea for the Baltic Sea Youth Philharmonic was born ten years ago in a concert of a project orchestra called the Baltic Youth Orchestra. Alongside Stravinsky’s groundbreaking ballet music, the ‘Baltic Folk’ programme will feature Rachmaninoff’s Piano Concerto No. 2, a work that Kristjan calls ‘the most nostalgic, the most Russian-themed concerto ever’. As soloist, we welcome our youngest ever collaborator, the 15-year-old Russian pianist Alexander Malofeev, one of the outstanding talents of his generation. Preceding the two much-loved Russian works by Rachmaninoff and Stravinsky will be a contemporary piece by the celebrated Estonian composer Arvo Pärt. His contemplative, hymn-like Swansong, which was premiered in 2014, is an orchestration of an earlier choral composition, ‘Littlemore Tractus’. Download the full ‘Baltic Folk tour programme here. In just over a month’s time, the Baltic Sea Philharmonic and Kristjan Järvi will be touring Sweden, Germany and Italy with a new, folk-inspired programme of music from Estonia and Russia. ‘Baltic Folk’, the orchestra’s second tour of 2017, begins on 19 August in Visby, on the Swedish island of Gotland. The orchestra then performs at the Rheingau Music Festival in Wiesbaden, Germany, on 20 August, before concluding the tour on 23 August with a performance at the Merano Music Festival in Merano, northern Italy. The music of ‘Baltic Folk’ has a strong Russian focus. In Stravinsky’s folktale-inspired The Firebird and Rachmaninoff’s Piano Concerto No. 2, we present two of the best-loved orchestral works of the early 20th century, both of which reveal their Russian essence in contrasting ways. In his groundbreaking ballet Stravinsky dazzles us with brilliant colours, the vitality of Russian folk music, and the magic of the mythical Firebird. And in one of the most romantic piano concertos ever written, Rachmaninoff bares his soul in dramatic music rich in Slavic melancholy. The ‘Baltic Folk’ programme begins, however, in the altogether different sound world of Arvo Pärt, the celebrated Estonian composer whose music is both deeply spiritual and emotionally direct. His contemplative, hymn-like Swansong is an orchestration of an earlier choral composition, ‘Littlemore Tractus’, in which Pärt set words from a sermon that the influential theologian John Henry Newman preached in 1843 in the English village of Littlemore. We are delighted to be making return visits to both the Rheingau and Merano festivals, which welcome us back after previous appearances in 2014 (in Wiesbaden) and 2011 (in Merano). And Visby is a special place for us, not just because the island of Gotland is such a beautiful natural environment but also because Visby is where the original idea for the Baltic Sea Youth Philharmonic was born ten years ago, in a concert of a project orchestra called the Baltic Youth Orchestra. Find out more about ‘Baltic Folk’ and book tickets here. The Baltic Sea Philharmonic musicians and Kristjan Järvi have returned home after an exhilarating first half of their ‘Waterworks’ tour of Germany and Denmark. Over 12 days the orchestra travelled 1,500 km and played to more than 8,000 people. The opening concert in Hattingen, Germany, was a sell-out, with standing ovations setting the tone for the subsequent concerts in Copenhagen and Aarhus, which met with an equally positive response. The players now have a three-month break before the ‘Waterworks’ tour continues in Germany in August. The programme includes one of the most famous of all water-themed pieces, Handel’s Water Music, in a special arrangement featuring variations by Charles Coleman and Daniel Schnyder. The orchestra is also celebrating the 80th birthday of American composer Philip Glass by performing Aguas da Amazonia, in an orchestration by Charles Coleman, and Glass’s Violin Concerto No. 2, with Russian-born violinist Mikhail Simonyan as soloist. The Baltic Sea Philharmonic’s passion for innovation shone through in the concerts, most noticeably with the introduction of cutting-edge lighting, video art and sound design, which transformed the musical presentation into an immersive concert experience. The musicians also sported a striking new look on stage, thanks to a collaboration with Estonian fashion house Baltika Group. Designers from Monton, one of Baltika’s five international brands, created 13 different outfits for the men and 9 different outfits for the women, all of which were styled to reflect the water theme of the programme. In another innovation, three members of the New York-based Absolute Ensemble – trumpeter Charlie Porter, bassist Mat Fieldes and percussionist David Rozenblatt – have been embedded in the orchestra. All three featured on Kristjan Järvi’s new recording of Aguas da Amazonia. Listen to the radio broadcast of the concert in Copenhagen here and watch a video review of the concert in Hattingen here. You can download the ‘Waterworks’ tour programme and book tickets for the remaining tour concerts here. The players of the Baltic Sea Philharmonic and Kristjan Järvi will be sporting an ultra-stylish look on stage thanks to a new collaboration with Estonian fashion group Baltika. A team of designers at Monton, one of Baltika’s five international brands, has created a range of concert clothing especially for the Baltic Sea Philharmonic’s first tour of 2017, ‘Waterworks’. The new outfits, which will be unveiled at the orchestra’s concert in Hattingen, Germany, on 5 May, have been specially designed to reflect the water theme of the programme, with shades of blue, white and grey replacing the dominant black of traditional concert wear. The ‘Waterworks’ tour marks the start of a long-term collaboration planned by the Baltika Group and the Baltic Sea Philharmonic. While Baltika has a design heritage stretching back almost 90 years, Monton is a product of the 21st century. Established in 2002 – making it only a few years older than the Baltic Sea Philharmonic – Monton has become the most successful Estonian fashion brand in the world. Take a look behind the scenes of the fitting of the outfits on our Facebook page and find out more about Baltika Group here. The Baltic Sea Philharmonic sets off this week on its first tour of 2017. After opening with a performance in Hattingen, Germany, the ‘Waterworks’ tour takes the orchestra to Copenhagen and Aarhus, Denmark, from 7 to 10 May, before resuming in August in Germany with performances in Berlin, Peenemünde, Lutherstadt Wittenberg and Hamburg. The repertoire for the tour celebrates the life-giving power of water and also the 80th birthday of composer Philip Glass. The Baltic Sea Philharmonic and Kristjan Järvi perform a special arrangement of Handel’s Water Music and a new orchestration of Glass’s Aguas da Amazonia, and Russian-born violinist Mikhail Simonyan joins the orchestra for Glass’s Violin Concerto No. 2 ‘The American Four Seasons’. There is special excitement surrounding the ‘Waterworks’ tour because it marks the start of a radical new approach to presenting orchestral music. The Baltic Sea Philharmonic is collaborating with lighting designer Bertil Mark, sound designer Chris Ekers and projection artist Philipp Geist to reimagine the concert experience, immersing audiences in a thrilling world of music, light, images and sound. ‘Concert goers should feel like they are entering a new dimension, a world where anything is possible,’ says Kristjan Järvi. Find out more and book tickets here and download our new ‘Waterworks’ tour programme. The concert took place on 23 April 2016 in the Moscow’s Tchaikovsky Hall, as a celebration of the 125th anniversary of the birth of Sergei Prokofiev. It featured renowned Prokofiev exponent Alexander Toradze performing the composer’s Third Piano Concerto, and the First Symphony, under the baton of Kristjan Järvi. The rest of the programme reflected the orchestra’s championing of the environment: Arvo Pärt’s Swansong, Gediminas Gelgotas’s Mountains. Waters. (Freedom), and Igor Stravinsky’s The Firebird. This is the third time Mezzo has broadcast our concerts – it previously transmitted BYP’s ‘Live from the Berlin Philharmonie’ from a January 2014 concert, and its Paris debut, from March 2015. The French television station launched in 1992, and now transmits across 44 countries to 18 million subscribers. Tune in to Mezzo here on 21 January 2017, 8.30 pm CET to watch the concert. Further broadcasting dates here. Baltic Sea Philharmonic and Kristjan Järvi performed a private concert yesterday, 8 December, in Vienna’s Konzerthaus, focused on the theme of the swan, and offering a sound experience, a light show and projections to create an immersive atmosphere of a Nordic landscape. Repertoire included Arvo Pärt’s Swansong and Kristjan Järvi’s arrangement of Tchaikovsky’s ballet, Swan Lake, both of which were part of the orchestra’s ‘Baltic Sea Discovery’ tour this September. The orchestra’s performance was accompanied by a projections and light show, put together by projection artist Philipp Geist, whose musical collaborations include an installation in Bayreuth to celebrate the 200th anniversary of Richard Wagner; sound engineer Chris Ekers, who produced the opening and closing ceremonies for the London 2012 Olympic and Paralympic Games; and light designer Bertil Mark, who works with many top German bands. The concert show is a taste of the orchestra’s plans for 2017, and their ‘Waterworks’ tour, which will create exciting concert experiences to bring in new audiences to classical music. Last night’s show was the annual Christmas concert for 1,200 employees of energy company OMV Aktiengesellschaft. See highlights of the concert show on our Facebook page. Baltic Sea Music Education Foundation has revealed the theme of next year’s ground-breaking Baltic Sea Philharmonic tour – ‘Waterworks’– and in 2017 it will continue its mission to bring classical music to wider audiences with an inventive concert format combining music, projections, light, sound and choreography. ‘Waterworks’ demonstrates the orchestra’s long-time commitment to the environment, celebrating the life-giving power of water with repertoire including Handel’s Water Music, arranged specially for Baltic Sea Philharmonic. The orchestra will mark the 80th birthday of seminal composer Philip Glass with his water-themed work Aguas da Amazonia, as well as his Second Violin Concerto The American Four Seasons, from 2009, performed by Russian violinist Mikhail Simonyan. Baltic Sea Philharmonic and Kristjan Järvi together with Mikhail Simonyan will tour with ‘Waterworks’ in May 2017 through Germany and Denmark. ’Waterworks’ builds on a successful 2016 for the foundation. In April, it launched its new orchestra, Baltic Sea Philharmonic, which went on two major tours of the entire region – ‘Baltic Sea Landscapes’ and ‘Baltic Sea Discovery’. 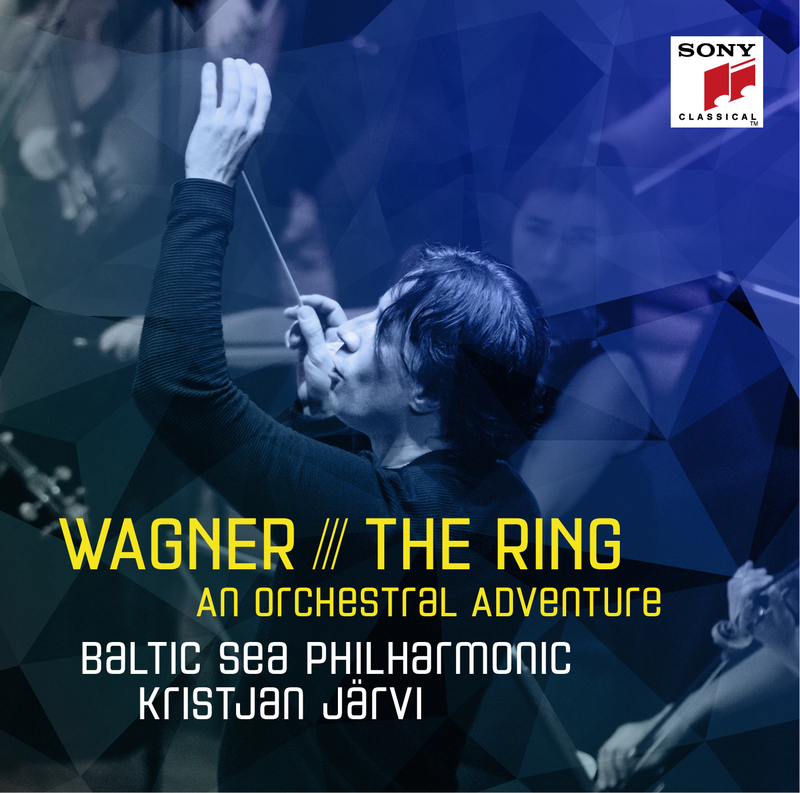 The young musicians performed ambitious programmes with three international soloists and released their first ever CD, highlights of Wagner’s Ring Cycle, on Sony Classical. They also took part in two historic concerts celebrating the 25th anniversary of the German–Polish Treaty of Good Neighbourship.